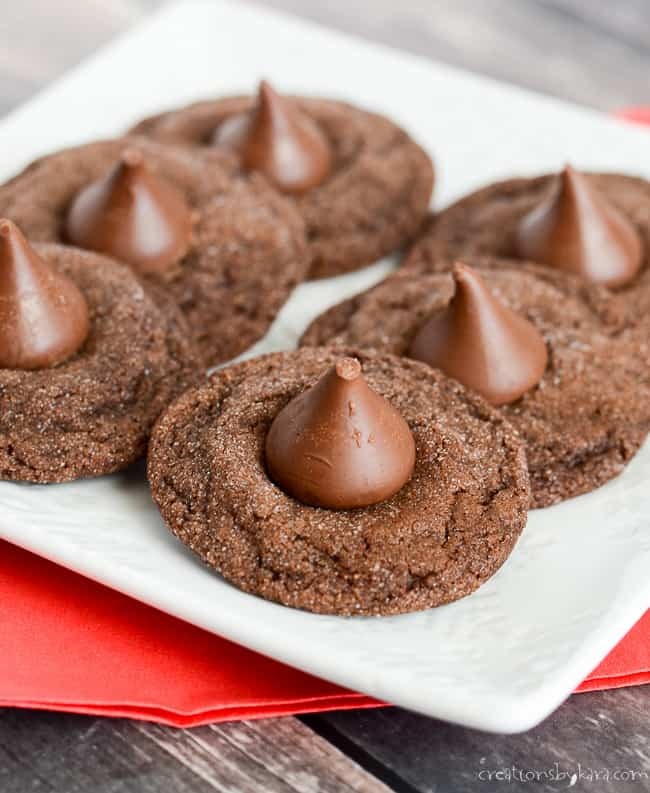 Double Chocolate Kiss Cookies – soft chocolate cookies rolled in sugar and topped with a Hershey kiss. A fun cookie for chocolate fans of all ages! I love baking with Hershey kisses. Traditional peanut butter kiss cookies are always a hit, but we also enjoy pistachio kiss cookies and mint kiss chocolate cookie cups. This chocolate version is a new favorite. 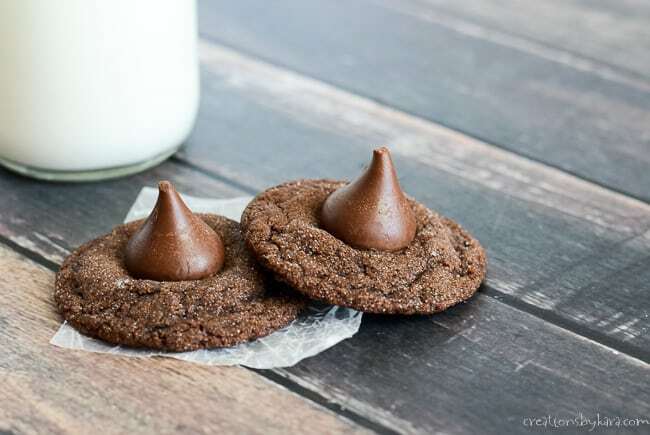 There’s just something irresistible about a cookie topped with a Hershey kiss. Who can resist them? Certainly not anyone in my family! Being a chocolate lover, I had to make a chocolate version. They are amazing! A sprinkling of sugar makes them pretty, and of chocolate cookie is soft, chewy, and simply divine. These are a yummy twist on a classic cookie. Cream butter and sugars in a large mixing bowl till fluffy. Beat in eggs and vanilla. In a small bowl, whisk together the flour, cocoa, baking soda, baking powder, and salt. Stir into the wet ingredients just till combined. Roll dough into tablespoon sized balls. I like to use a cookie scoop so that my cookies are the same size. Roll in sugar. Place onto lightly greased or silpat lined cookie sheets. Bake at 350 for 9-10 minutes. 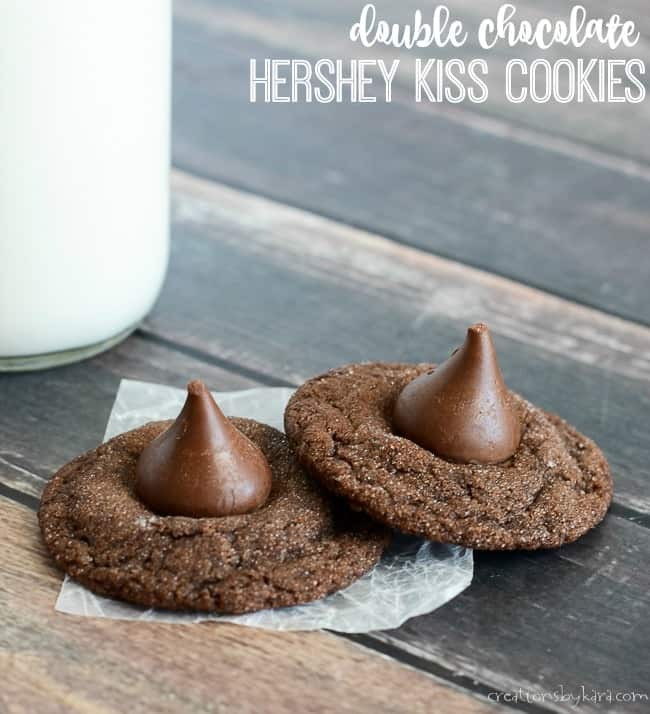 Immediately place an unwrapped Hershey kiss in the middle of each cookie. Cool completely on cookie sheets, or move very carefully to cooling racks. 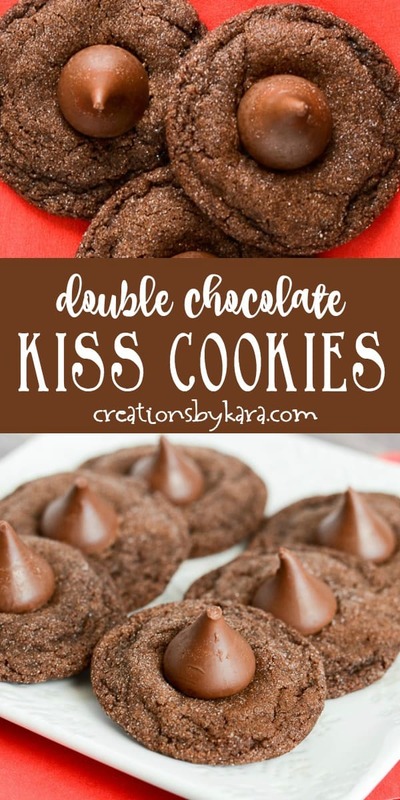 How to store chocolate kiss cookies: These cookies will stay soft and fresh for 3-4 days at room temperature in an airtight container. If you want to store them longer than that, they freeze really well. I place them in freezer ziplock bags, and they are great for several months. 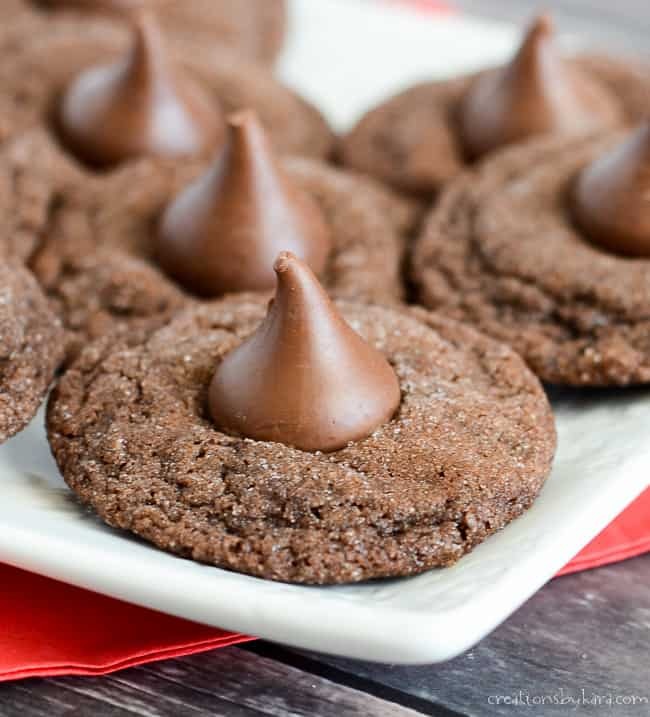 Soft chocolate cookies rolled in sugar and topped with a Hershey kiss. Cream butter and sugars in a large mixing bowl till fluffy. Beat in eggs and vanilla. In a small bowl, whisk together the flour, cocoa, baking soda, baking powder, and salt. Stir into the wet ingredients just till combined. Roll dough into tablespoon sized balls. Roll in sugar. Place onto lightly greased or silpat lined cookie sheets. I like to buy the big bags of kisses, but you will have some leftover. I could go for a plate of those cookies right now! They look so chocolatey good. I made a batch of these for when my kids got home from school and they were gone within 10 minutes!! You are such a nice mom. I need to do that more often! Wish I were noshing on one of these chocolatey delights right now! Perfect for chocolate lovers! Love the sugar coating! I should add sugar coating to more of my baked goods. It makes them so pretty!